For players looking to play their way on to the 23 man World Cup roster for the US National Team, last night was all about making a strong last impression on US Manager Bruce Arena and his staff. Unfortunately, much like with the 4-1 loss to Germany, the US wasn't particularly strong. And only a few players made a strong positive impression leading up to the May 2nd announcement of the 23 man US roster, which will be carried live on ESPN at 6pm EST. Midfielder John O'Brien (pictured at left courtesy of Jarrett Campbell) made his first national team appearance in over 6 months when he entered the match in the 67th minute. The rust was obvious for O'Brien, but so was the skill. And you can bet that Bruce Arena and his staff will be following Chivas USA closely over the next few weeks as O'Brien works his way into form. Ben Olsen's goal off of Landon Donovan's quick restart may have pushed the DC United midfielder onto the final 23. 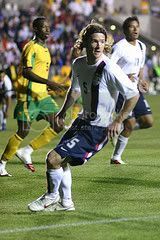 And New England Revolution midfielder Steve Ralston may have seen his hopes of making the World Cup roster dashed with a rather uninspiring performance that ended with a groin strain. With O'Brien and Claudio Reyna nursing injuries and fellow New England midfielder Clint Dempsey coming on strong, Bruce Arena may not want to roll the dice on Ralston's ability to stay healthy heading in to the World Cup. But for me, the worst news of the night was that Shelley Smith is going to be embedded with the US team during their World Cup run. Couldn't they get Heather Mitts or Brandi Chastain to do that job? It was painful listening to Smith's sideline reporting last night. This past Saturday, we were lucky to have as a guest on Kick This! young Rhino fan Daniel Myslivecek. Daniel has been fighting stage IV metastatic melanoma which is very a very rare form of cancer in children. Daniel has seen his fight with cancer take him from the Golisano Children's Hospital to Denver, Colorado, and to the National Cancer Institute in Bethesda, Maryland. Daniel has already exceeded expectations as last July his doctors at Golisano Children's Hospital gave him only 4 to 6 months to live. It's eight and a half months later and Daniel is still fighting. Former Rhino midfielder Shaun Tsakiris helped set up a Make a Wish visit for Daniel with the US Men's National Team when they were at the Home Depot Center to play Norway in January. Daniel was able to take in a training session, the match, and go into the locker room following the match. US captain Landon Donovan even gave Daniel his #10 jersey from the match and his Nike boots that he used to set up Chris Klein's 87th minute goal.